Inspector, EP Electrician (Excavation)/Tech Electrician (Non-Excv. )/Technician and Assistant Foreman (Electrical) vacancies. Eligible criteria having candidates are suggested to apply online from 10-08-2018 to 10-09-2018 (midnight). Candidates selection is based written exam for this CCL recruitment of Mining Sirdar and Electrician Jobs. This is such a big recruitment of Central Coal Fields. For information regarding this CCL Recruitment 2018 see the details given below. 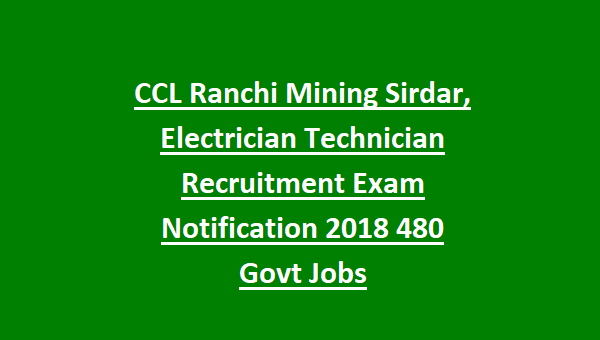 There are total 480 Mining Sirdar, Electrician vacancies available in the Current recruitment of CCL. Candidates age limit should be between 18 – 30 years as on 10-08-2018. As per government norms age relaxations are applicable i.e 5 years for SC/ST and 3 years for OBC Candidates of Non Creamy Layer. For Assistant Foreman Matriculation with 3 years Diploma in Electrical Engineering and valid Electrical Supervisor ship for mines. For Electrician Non Technician Matriculation with ITI in Electrician Trade. Must have completed apprenticeship training. Selection for this CCL recruitment will be held based on written test only. Application fee for General and OBC candidates Rs.100/- and no fee for SC/ST candidates. Eligible candidates have to pay the application fee through online using debit/credit card/net banking. Or using chalana generated after completion of application online. Eligible candidates have to apply thorough online only using the official website of CCL “www.centralcoalfields.in” from 10-08-2018 to 10-09-2018 (midnight). Click on Online services and choose the Online recruitment option and click to proceed. Then submit the all necessary details carefully. After completion of application process and fee payment take printout and send the photo copy of application form along with Self attested photo copies of educational certificates, Community Certificate and mark sheets, two window envelope of 25.4 X 11.4 cm size, passport size color photograph, NOC in an envelope and super scripted as “Name of the post applied for and Application ID” and send to the below given address through Registered Post/ Speed post on or before 20-09-2018. 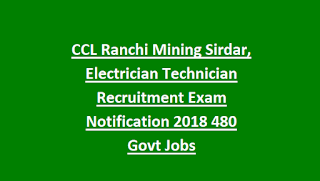 Click here to apply online for the CCL Recruitment of Mining Sirdar, Junior Overman, Electrician,Asst Foreman. Please share this information of CCL Recruitment with your beloved friends via the social media. There are total 989 vacancies available in the Current recruitment of CCL.